Abby Martin highlights the top five companies that aided Nazi Germany during the height of WWII, calling out companies such as Hugo Boss, IBM and Ford. Newly-released documents expose more explicitly the details of IBM’s pivotal role in the Holocaust — all six phases: identification, expulsion from society, confiscation, ghettoization, deportation, and even extermination. 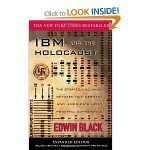 Moreover, the documents portray with crystal clarity the personal involvement and micro-management of IBM president Thomas J. Watson in the company’s co-planning and co-organizing of Hitler’s campaign to destroy the Jews.